It seems like fidget spinners are everywhere I turn. I walk into a lesson, and instead of seeing faces, I just see small propellers spinning all over my classroom. 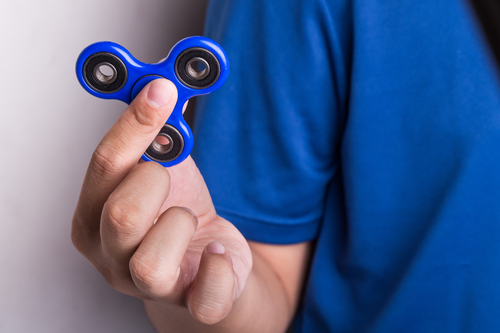 While some teachers have chosen to ban spinners because they have become more of a distraction than a tool to enhance focus, I think that they can actually be helpful in the classroom, when used with the right guidelines. Personally, I have never been so bothered by students doing small things on the side in my lessons. I don’t even mind when students eat in class, as long as they don’t make a mess or distract their friends, and they can still write and pay attention. So allowing fidget spinners in my classroom is a logical rule, as I have seen that they actually can help certain students focus, or at least zone out for a minute or two in a non-distracting way. As long as the students are writing and reading when they are supposed to, spinners offer a great way to take a mental break for a minute or two. Like I said, though, there must be clear guidelines. I do not allow students to share spinners, or to spin them on the desk. Sharing makes too much of a commotion, and creates a distraction as spinners are passed from one student to another. Spinning on the desk is also a problem, because the buzz that is created is loud enough to distract me. However, when a student is just holding a fidget spinner in their hand, there is a slight buzzing sound, but I haven’t found it to be particularly distracting to myself or the other students. I teach boys and girls, but in separate classes, and I have noticed a marked difference in the way that they use fidget spinners. Girls tend to just hold the spinner in their hands and use it in the most obvious way: spinning it. Boys, on the other hand, mostly take the spinners apart, trade parts, and put them back together. The deconstruction and reconstruction can become a huge distraction, especially when pieces clatter noisily to the floor and then the students have to run around looking for them under everyone else’s feet. So that is another rule that I think should be added to the book: no taking spinners apart. Paying attention in class is a challenge, even with a dynamic teacher. A teacher might be explaining something that is too difficult or too easy for a particular student, or a student may just be distracted by something that is happening in their personal life. Whatever the reason is for boredom or lack of focus during a lesson, it is important to give students outlets when they are having difficulty focusing. Demanding 100% attention throughout every lesson is simply unreasonable. I probably wouldn’t recommend fidget spinners to students who have no problem focusing, but I think it can be a great outlet for someone who just needs a little something to do on the side. It’s certainly better than turning and chatting with friends, moving restlessly around in your seat, or getting up to walk out of the classroom. Based on my experiences in the classroom in the past few weeks, so far I am in favor of fidget spinners. I think it’s always better to give clear guidelines about how to use something, rather than banning it, when possible and relevant. I think students appreciate teachers who understand how difficult it is to sit through class, and try not to be stricter than they have to be. If following your rules means that students are allowed to have spinners, you may just find that they are suddenly motivated to behave better in class altogether. By turning spinner use into an incentive, and giving students a minimally-distracting outlet in the classroom, we might just be able to help the whole class focus better. What have your experiences been with fidget spinners in the classroom? Do you think we should allow this latest trend into our learning spaces? Please leave your answers in the comments below.